High Performance InfraRed and White Light Illuminators. 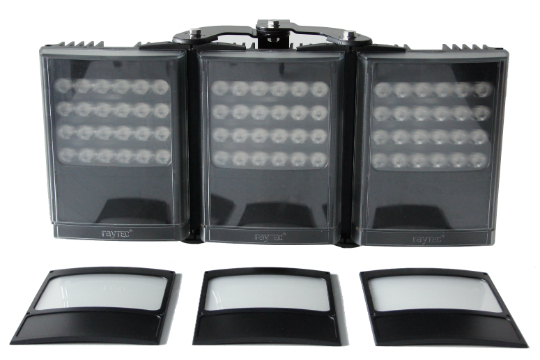 www.RayLED.com sells online a complete range of Infra-Red and White-Light LED illuminators for CCTV and Safety Critical applications. Our goal is to improve the safety of any sensible area at night by improving the performance of CCTV systems under darkness. We provide a large range of LED illuminators to create a safer global environment whether used in combination with surveillance cameras, for deterrence or as general area lighting. We are committed to technology and innovation. Our products combine cutting edge technologies with the highest levels of quality to deliver outstanding performance and reliability. Our philosophy is based on innovation+illumination and we will always look to lead and anticipate lighting trends in the market. Our products are the top quality in the CCTV industry, built and hand mounted on demand to benefit from the latest SMT LEDs technology. We are passionate about the environment and have a true Green Philosophy. Products and functionalities are designed to save energy, electrical consumption and reduce CO₂ emissions. All needs and requirements can be satisfied with available angles from 5 to 180° / 360° (with 2 units) and distances from 8 to 1 000 meters. RayLED can propose a variety of power supply possibilities: external PSU to power between 100-240V AC, or integrated PSU to power on a 12/24V AC/DC source, or on PoE. Fully dedicated product ranges are available: RayMAX for Infra-Red, RayLUX for White-Light, PLATINUM Hi-Performance range, PANORAMIC Ultra Wide 180°, Adaptive Illumination all in 100-240V AC. The VARIO Low Voltage 12/24V AC/DC with Multi-Angle Interchangeable Lensing system + remote control, URBAN for General Area & Industrial Lighting, SPARTAN for Hazardous Areas / Anti-Explosion IECEX ATEX... And now, the new VARIO in IP PoE, PoE, HYBRID, IP PoE HYBRID with combined IR and WL in a single unit, the D-ZOOM with remotely adjustable beam angle, the EXTREME (for extreme conditions use), ESPRIT / TWIN for PTZ needs, VLK and PULSESTAR for ANPR/LR needs... Available in both 850 and 940 nm wavelength. All RayLED illuminators includes inbuilt power adjust, inbuilt photocell with adjustable sensibility for automatic on/off - day/night operation, telemetry connection for remote operation. The latest VARIO product ranges have a remote control available to buy as an option. All are IP66 weather proof, Anti-Vandalism, usable between -50/+50°C and under 5 YEARS WARRANTY for an expected lifetime of 10+ YEARS. All are ready-to-use upon delivery and are equipped with a universal bracket at their back to fix on wall, ceiling or any flat surface. Additional pole brackets are available in the bracket section of our shop. VIDEO : RayMax Infra-Red Illuminator in action!